The car news this week covers the new BMW Z4 and X5 models, a sportier Ferrari California T and a car which could potentially become the world's most expensive car! Italian supercar manufacturer Ferrari have announced that their California T has a new option pack coming known as the the Handling Speciale (HS). The Handling Speciale costs roughly £5,300 and adds stiffer suspension (16 percent at the front and 19 percent at the rear) to improve the car's composure at high speeds, improved dampers for increased acceleration out of corners, a new louder, sportier exhaust system and a tweaked gearbox that means faster shifts. There are some slight exterior changes too. Firstly the grille and rear diffuser are finished in a new colour known as Grigio Ferro Met (a sort of matt grey) and the exhausts get a subtle matt black finish too. There's also a plague in the cabin to highlight the fact the car is Handling Speciale, which is a subtle but nice touch. The car is expected to make its debut at the Geneva Motor Show in March, so when it does we'll be sure to bring you the photos! Both the new BMW Z4 roadster and updated X5 have been spotted in the usual camouflage disguise undergoing winter testing ahead of their 2017 launch. The Z4 roadster - which could potentially be called the Z5 - shows a few style changes including a longer, lower, more pointer front-end, a set-back cabin, and a number of changes to the rear. It also seems to have dropped the hard-top roof in favour for a lighter, more traditional fabric one. It's hard to make out exactly how the car will look, but with the car expected to launch in the first half of 2017 we may get some details sooner rather than later. The updated X5 is just as difficult to make out, but it does look as though BMW are looking to significantly change their approach to SUV design with a less boxy look than the current model. The details are minimal on the car at this stage, but the engines will probably be the same too as it's a facelift opposed to a new generation. Again, we should get the full reveal later this year as the car is expected to launch in the second half of 2017. Could there be a new world's most expensive car? A spectacular 1957 Ferrari 335 Sport Scaglietti is set to go under the hammer at the Arterial Motorcars auction on February 5th and could come become the world's most expensive car. This particular 335 was originally powered by a 3.8-litre V12 engine when it began racing for Ferrari, but it was soon enlarged to a 4.1-litre to make it more competitive which led to much success including a lap record at Le Mans. It's estimated to fetch a whopping $35,745,600 (around £24,393,150), which would see it go straight to second on the most expensive car list, with first place being a Ferrari 250 GTO which sold for $38,115,000 (£26,758,637) in 2014. The 355 would need to sell over it's estimation by a few million dollars to get first place, which isn't unlikely considering the demand of a car with such a presitigous and detailed history. We'll just have to wait and see the outcome come February 5th! BMW have revealed that all of its 4 Series models - the Coupe, Convertible and Gran Coupe - will all get engine revisions in the Spring. The new engines are similar to those that were introduced on the 3 Series range last year, which includes a new '440i' flagship engine that replaces the old 435i. This new engine is 322bhp and has 330lb ft of torque, which is 18bhp and 36lb ft more than the older 435i. These power tweaks mean a decrease of 0.4 seconds on the car's 0-62mph time, meaning it now hits the mark in five seconds dead. 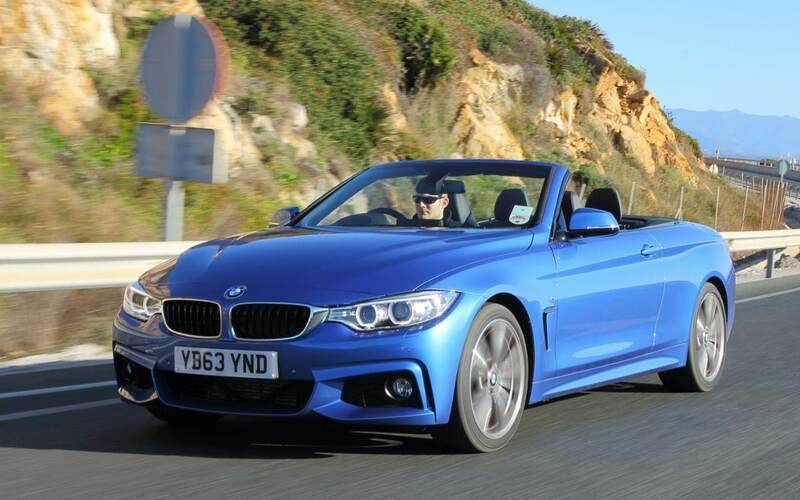 Other engines include the 430i which replaces the 428i, as well as a completely new diesel engine - the 425d. They both produce 249bhp and 221bhp respectively, with 0-62mph times of 5.8 seconds and 6.1. All three engines seem pretty impressive and will no doubt help build on the success the 4 Series has achieved thus far since its launch in 2014. The Aston Martin DB10 that was used in the latest James Bond film Spectre is set to go to auction with all the money raised going to humanitarian-aid charity Médecins Sans Frontières (or Doctors Without Borders in English). The car uses the same 4.7-litre V8 engine found in the V8 Vantage, however what power it possesses is unknown. The Vantage itself has a 420bhp engine, so you'd expect it to be around the same or even a bit more. Only 10 DB10's were made for the movie with eight used for filming and two for promotional uses, meaning none are available to buy unless Aston Martin say so. This particular one was a filming model and will be sold at a Spectre-themed auction, with Aston expect it to raise around £1million due to it's rarity and involvement in the film.